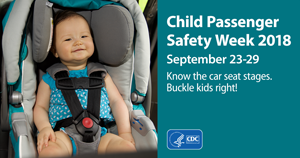 Colorado Child Fatality Prevention System: Child Passenger Safety Week! In the United States, motor vehicle–related injuries are a leading cause of death among children. Always buckling children in age- and size-appropriate car seats, booster seats, and seat belts reduces the risk of serious and fatal injuries by up to 80%. This year’s Child Passenger Safety Week is the perfect time to raise awareness about the importance of always properly buckling children. CDC’s Injury Center has recently updated our resources and website to reflect the new child passenger safety guidelines from AAP and best practices. Make sure children are properly buckled up in a car seat, booster seat, or seat belt, whichever is appropriate for their weight, height, and age. Rear-facing car seat: Birth until age 2-4. For the best possible protection, infants and toddlers should be buckled in a rear-facing car seat, in the back seat, until they reach the upper weight or height limits of their seat. Check the seat’s owner’s manual and/or labels on the seat for weight and height limits. Forward-facing car seat: After outgrowing rear-facing seat until at least age 5. When children outgrow their rear-facing seats, they should be buckled in a forward-facing car seat, in the back seat, until they reach the upper weight or height limit of their seat. Check the seat’s owner’s manual and/or labels on the seat for weight and height limits. Booster seat: After outgrowing forward-facing seat and until seat belts fit properly. Once children outgrow their forward-facing seat, they should be buckled in a belt positioning booster seat until seat belts fit properly. Seat belts fit properly when the lap belt lays across the upper thighs (not the stomach) and the shoulder belt lays across the chest (not the neck). Proper seat belt fit usually occurs when children are about 4 feet 9 inches tall and age 9-12 years. Seat Belt: Once seat belts fit properly without a booster seat. Children no longer need to use a booster seat once seat belts fit them properly. Seat belts fit properly when the lap belt lays across the upper thighs (not the stomach) and the shoulder belt lays across the chest (not the neck). Proper seat belt fit usually occurs when children are about 4 feet 9 inches tall and age 9-12 years. For the best possible protection, keep children properly buckled in the back seat. Join us all week on social media @CDCInjury to get tips. Share CDC’s recently updated resources. Read CDC’s feature story: Child Passenger Safety. Visit CDC’s Child Passenger Safety Website (English and Spanish). Need help? Find a car seat inspection station near you. Questions or problems? Please contact support@govdelivery.com. It's National Suicide Prevention Week! September is Infant Safety Month!